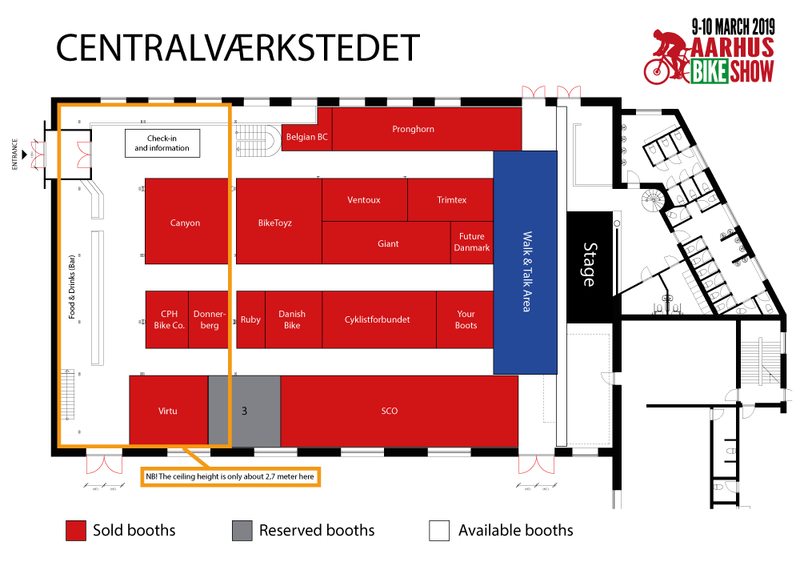 On the maps beneath you can see the available booths at Aarhus Bike Show 2019. 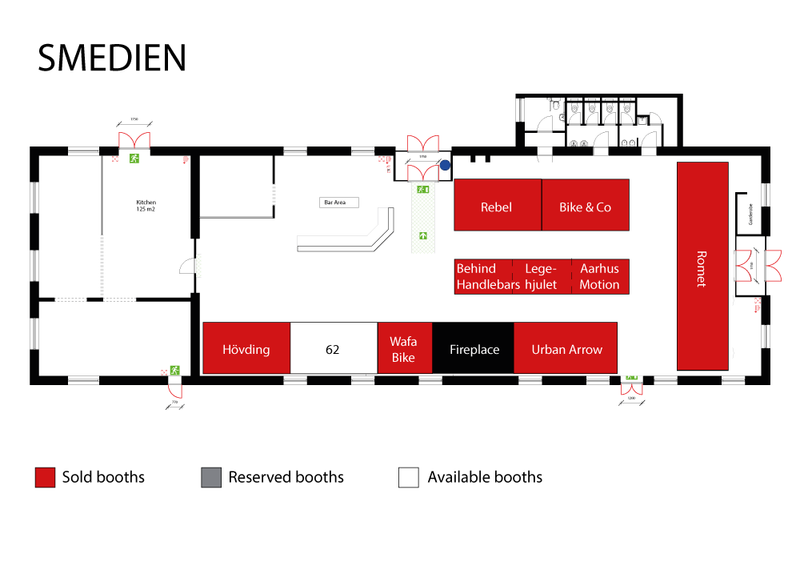 The retro industrial style of Centralværkstedet and Smedien will form the perfect context for the fair, that during the past year was held at Ridehuset with much less space. The locations of the buildings are right in the city centre of Aarhus with the shopping centre Bruun’s Galleri, Aarhus train station and the hotel Comwell as neighbors. Not far away you will come across Aarhus bus terminal. 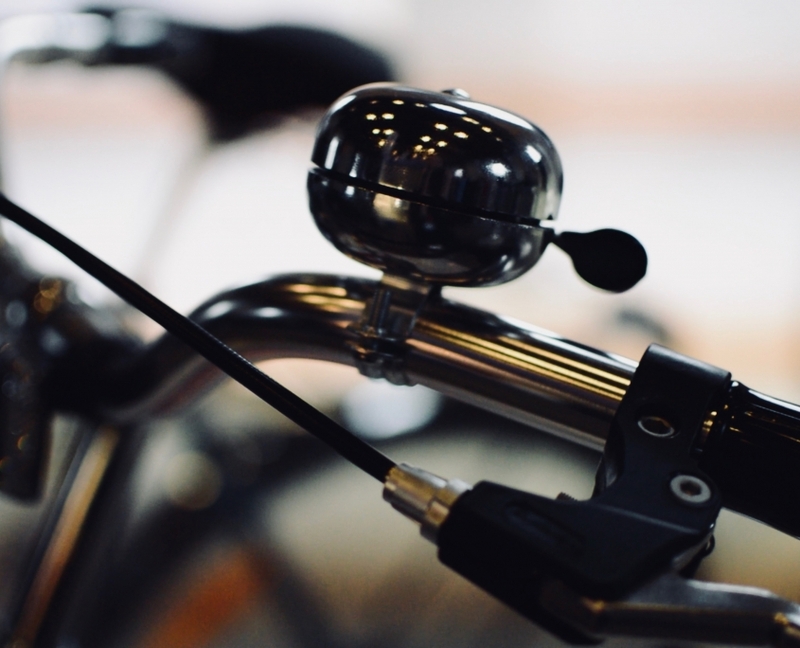 If you arrive by car you can park at Bruun’s Galleri, along the roads or other parking sites. NB! Since the last map update some stands may have been sold or reserved. Please contact us for information on available stands. Ready for booking your stand ? The section in front of the stage is dedicated for the “Walk & Talk” exhibitors who do not have a fixed stand, but can circulate among the visitors and hand out printed materials, business cards etc. High café tables are placed in this area to create a relaxed atmosphere for talking to the visitors. Every “Walk & Talk” exhibitor can set up 2 pieces of roll-ups. During the presentations from the stafe, the “Walk & Talk” exhibitors must roll down their roll-ups in order not to block the visibility of the audience. A suggestion is that the “walk & Talk” exhibitors spend time handing out material among the visitors elsewhere and take advantage of the café for meeting potential customers. There will be 2-4 presentations each day from the stage. Each presentation is approx. 35 minutes long.